Roberta keeps things roling with our next interview. We step away from heavy metal to more of a blues rock with The Killing Floor. JCM does a great job answering Roberta's questions, so sit back and enjoy the read. Roberta: How Did you all come together as a band? Were you friends first? JCM: I played with a couple of blues band with female fronted singers back in 98' before I started to do my own thing. It's been a tough road finding the right people to lock in with the same goals and vision. You wanna weed out the attitudes, backstabbers, and flakes wanna be's and I can say this now… This version of The Killing Floor is the right chemistry, talent and attitude. My brothers from other mothers: Jack, Miguel, Darren and Larry there are my best friends, musicians and human beings… They would give their shirts off their backs and not shove a knife into you while do so. It all about true colors and I'll just leave it at that. Roberta: At what age did yu play your first Instrument? BTW- My starting instrument was the drums. Roberta: Descibe your music Style the Best you Can!!! JCM: I and or we, don't setup ourselves for any formula or trend and we are not here to re-invent the wheel either. But I don't want to be recantation of what's already been done and though we are what we eat and drink… You'll hear our influences that will definitely show, but not as a rip off or a re-creation. I just let things flow and let the music take its shape. "Mary Jayne" was written in two hours where as "Its Not Me" took me ten years…. Roberta: Who are your Biggest Influences in music? JCM: Way, way- too many to list but my top five for right now and it changes too… Jimi Hendrix, Ian Moore, Stevie Ray Vaughan, Paco De Lucia and Audioslave. Roberta: Are there any shows scheduled for your band ? and will they be Local or Statewide? JCM: Big transitions have happen in both my personal life and the band… Our focus right now is the release and promotion of The Killing Floor CD. We will venture out side San Antonio, that's for sure, and out of state gigs will be more baby steps… We have so many friends in bands and fans that would love for us to play in there town and that's one of our biggest goals to make realize. Spread the gospel and share the vision and feel of our music to you and for you… So it's definitely in the works. Roberta: Who,s the Songwriter in your band? JCM: That would be me… but Miguel and Darren are no slackers… They will bring many great ideas and styles so the next CD will definitely bring and breathe another dimension. Our formula and standards is to be true to our hearts and we are fans of our music as well. You have to be… So we have NO fillers songs. Every note counts and every lyric has a meaning. We mold and create with our hearts, mind and soul. So in essences the music is honest and a success to us and for us. It has to rip and it has to groove before we presented to a live audience. No process cheese labeled, flavor of the month and packaged crap here that dominates the corporate mainstream music of TV and radio today. And yes even our cover tunes go through the same treatment. So we are absolutely NOT a cover band or a jukebox… Every sound we squeeze out of a cover tune will be in the vain of The Killing Floor. Roberta: If you could choose any 3 bands to go on a massive tour with? Who would they be??? Roberta: Are their any plans for a CD coming out soon? or any other Projects that you are working on? JCM: The CD has been done and recorded since Spring of 2006 but there might be a few more tweaks from what you hear on MySpace or our podOmatic podcast. The new CD release date is March 15 ,2007. I do want to apologize to everyone anticipating last years release date. I didn't foresee the rocky roads ahead that then reared its ugly head at the last minute and almost broke the sprit of the band. But this is now and everything is for a reason and I really see this as a blessing more than anything else. Thanks to the new fire in the band Darren and Miguel, and plus the band looks way better too… Also want to mention… Peter Carey has been a total sweetheart from the start. He co-produced, engineered it and did all the piano parts and the whole project was recorded at his studio The Rhythm Room Studios. He's been patient and very understanding on this whole 2006 Killing Floor saga. Roberta: Where was the first place, that you performed at? JCM: At the infamous Tacoland in San Antonio. It shape and formed lots of great bands and it had this irresistible vibe that could not or ever be touched or matched. The owner Ram was killed a couple of years ago and Tacoland died with him that very dreadful night. Its had an impact on the San Antonio music scene and something was lost but Tacoland will not be forgotten. I've seen and heard of other so-called happening San Antonio venues opening and then closing and then being gone. But Tacoland and its legacy is stilled being talked about today and still being felt because it was real life honestly that starred at you in the face when you performed there. Good or bad it took some set of balls to play there. I was given a chance to play Tacoland many times after performing at a Mars Music birthday party staff event back in 2001 if I remember the right year… Herbfest Oct. 2001 was the name of the event. Some of the very best musical talents in town were there that night to witness my greenest and fumbleness for the first time as a front man...lol Yeah no pressure here at all. Nahh… It was great; I've been hooked ever since. Roberta: How Long have yu all been Together as a Band? 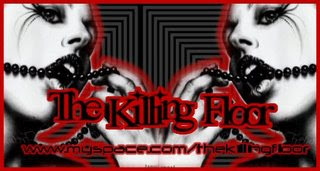 JCM: The Killing Floor… about six years… with different band name and members. But I've been the visionary one from the very start since May 2001. I have to express that not all of the past members of The Killing Floor have been bad. Matt Wicks played bass for The Killing Floor for about five to six months along with Jacob on the drums… These guys were great people that lend their time and their high talents during a time of need. You guys will always be in my heart and I will never forget. Roberta: On the Whole, Do you feel there is too much attention paid to the Lyrics? rather than concentrating on the music! Which is where, its really at! On a lighter note: Almost everything that's music related is relied on computers to fix, compose, copy and paste… Technology has come along way and it's great and it's very much needed… But human imperfections are also good for that human touch and feel. You don't want to sound too perfect like a machine or computer. That's why CD record sales are low and other forms of radio now exist. Like satellite, internet radio and I love listening to college radio stations… They bring out talent you'll almost never hear on the radio. Public access local music shows are also a blessing and are very welcome and needed. I heard Tom Rigney on a KSYM, a college radio station in San Antonio. He has incredible melodies and arrangements… I just love his music and he's also shreds on the violin. God bless all the people that promote indie and unsigned talent and yes even MySpace… There's hope for all of us listeners and us the artists. Roberta: Where do you see yourself in Five years? JCM: Most definitely doing the same thing… Once the fun factor is gone then it's time to hang up the gloves and move on to other things. It's about creating and exploring music to the fullest without the pressure of trends, or what other people say you should do. Five years ago we consider ourselves a blues band… Now I'm not so sure, but if it feels good and moves you, then it really shouldn't matter what style it is presented in. I remember playing gigs and sharing the bill with younger kid bands and they would come up to us and complements us and then referred to us as being old school… Kinda funny when I still see huge sellers of re-issue/remastered, and reunions, CDs of Queen, Pink Floyd, Deep Purple, The Doors, Jimi Hendrix, AC/DC, Kiss, Led Zeppelin, Aerosmith, Rush, CCR, Black Sabbath and I can go on and on. Ten to fifteen albums later and some are still recording and touring arenas after thirty- forty years… Their music will be timeless and will stand through the sands of time. That's my schooling and the long haul is what I'm about and so is the band. I'm not changing my musical roots, clothes or the color of my guitars and my hair to sell my soul to the temptation of trend. Roberta: Do you have any Groupies? To our future groupies, bands, fans, friends, family and or just the curious… The Killing Floor would like to thank each and every one of you for your support and showing the love. I've met so many great people from all over the US and the world through MySpace and some from our home too. We will try our best to bring you the music live to your home town and if not taped. But know that's our performances is always spontaneous and entertaining and never the same. We love what we do so yes… It's a labor of love. D-Day's Revenge's awesome website. Also check'em out for there interviews, album reviews, metal news, columns, viewpoints, message boards that will introduce you to some up and coming bands.